We have carved a niche as one of the distinguished Pillar Type Hydraulic Press Manufacturers, Exporters, and Suppliers, based in India. The Pillar Type Hydraulic Press provided by us is ideally used for generating a compressive force in varied industrial applications. Our Pillar Type Hydraulic Press facilitates the operator to have an access from three sides of the press. The different pillars act as bearing rods for the moving platen. 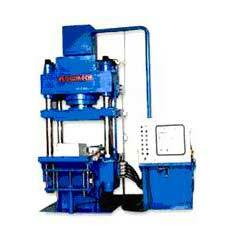 Moreover, we offer our Pillar Type Hydraulic Press in capacities up to 1000 Tons.